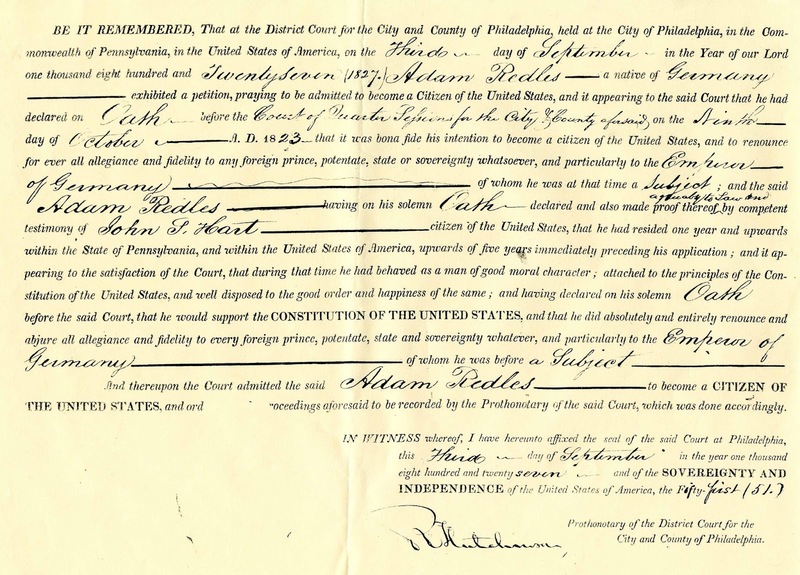 I'd like to commemorate my maternal 3rd great grandfather Johann Adam Roedelsperger* for becoming a U.S. citizen on this date, September 3, 1827, 186 years ago! Johann Adam boarded the Brig Maria in Bremen, Germany, and landed at Philadelphia on October 5, 1802, to start a new life (click on the images for a larger view). He was just 21 years old and was a turner by trade (turning wood on a lathe). Ship's manifest for the Brig Maria. Arrow is pointing to my 3rd great grandfather "Adam Rodelsberger." Customs declaration for the Brig Maria with date of arrival of October 5, 1802. 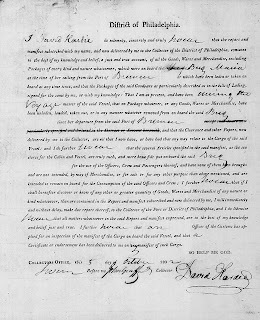 He declared an oath to become a U.S. citizen on October 9, 1823, 21 years after his arrival, and his petition was approved four years later, on September 3, 1827. By this time, he had changed the spelling of his surname to Redles, married Sarah (Sallie) Rulon, and had several children, one of whom is my 2nd great grandfather John Adam Redles. Naturalization record for John Adam Redles sent to me by my cousin Ken Redles. This is a copy of the original. Glad you came to America, Johann Adam Roedelsperger (aka John Adam Redles)! 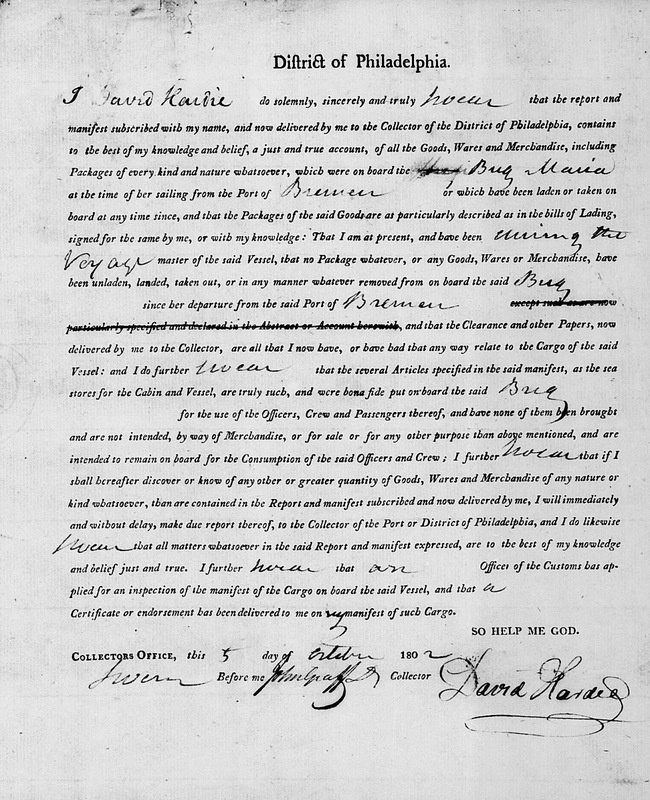 All images of the ship's manifest and Customs declaration are from familysearch.org. 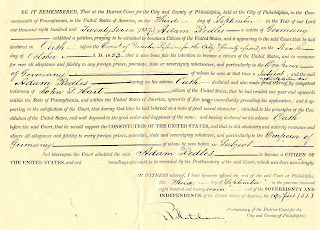 "Pennsylvania, Philadelphia Passenger Lists, 1800-1882," index and images, FamilySearch (https://familysearch.org/pal:/MM9.1.1/KC8G-JC7 : accessed 29 Aug 2013), Adam Rodelsberger, 1802. Ralph Beaver Strassburger, LL.D. Pennsylvania German Pioneers: A Publication of the Original Lists of Arrivals In the Port of Philadelphia From 1727 to 1808. Edited by William John Hinke, PhD., D.D., Second Printing, Volume II, 1785-1808 (Baltimore: Genealogical Publishing Company, 1966), 116-117.